Précis: To briefly describe the biochemistry of dopamine and dopamine receptors, dopamine physiology, and therapeutic strategies for replacing dopamine in Parkinson’s. But first, some “Purple Haze” by the Jimi Hendrix Experience. Biochemistry of dopamine: Dopamine has the chemical structure of 3,4-dihydroxyphenethylamine and is a member of the catecholamine and phenethylamine families. Dopamine is a neurotransmitter, which means it delivers a message in the central nervous system. Here are some brief details of dopamine synthesis: dopamine is a derivative of the amino acid tyrosine; the enzyme tyrosine hydroxylase forms DOPA; DOPA decarboxylase then removes carbon dioxide from DOPA to give dopamine; dopamine can be further modified to norepinephrine and epinephrine (see figure below; also see https://journeywithparkinsons.com/2015/04/01/dopamine-a-symbol-of-hope/ ). Figure 1. Synthesis and structures of dopamine [systematic name is 4-(2-Aminoethyl)benzene-1,2-diol)]. The pathway to making dopamine by catecholamine neurons in the brain (Top panel). A 3-D rendering of dopamine [https://upload.wikimedia.org/wikipedia/commons/3/36/Dopamine_3D_ball.png (Bottom left panel)]. 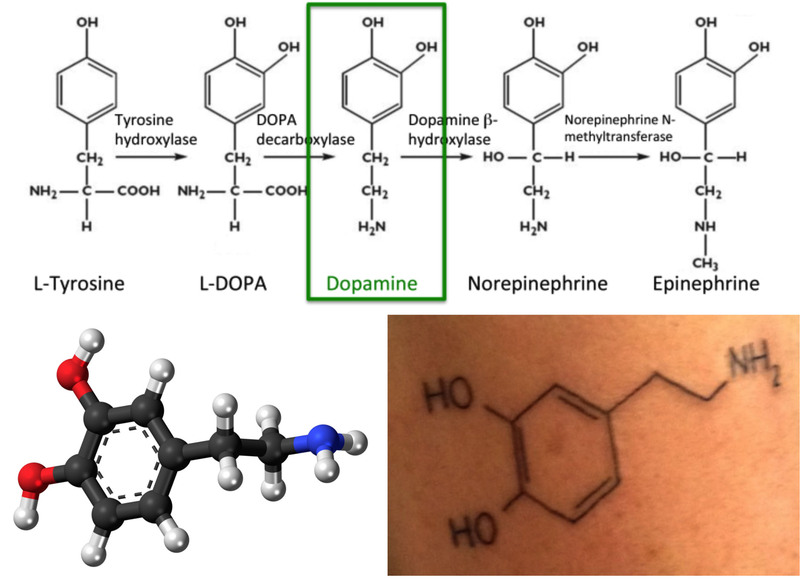 My dopamine tattoo [a symbol of hope (Bottom right panel); also see https://journeywithparkinsons.com/2015/04/01/dopamine-a-symbol-of-hope/ ]. Dopamine receptors: Dopamine is a chemical messenger. Neurotransmitters are endogenous substances that transmit signals across a synapse from one neuron to another “target” neuron or to another nerve fiber, a muscle fiber, or some other structure. There are 5 different dopamine receptors (D1, D2, D3, D4, and D5) that provide for all of the physiological functions of dopamine (for a comprehensive review of dopamine signaling, go here: http://pharmrev.aspetjournals.org/content/63/1/182.full). Here in this post, simply think of dopamine as a key that can unlock 5 similar but different locks (see Figure 2 below). The key (dopamine)-lock (dopamine receptors) interaction initiates a series of signals to the target neuron. It is beyond the scope of this post, but it is important to note that dopamine receptors are G protein-coupled receptors (GPCR’s); once engaged by dopamine, signals are initiated by activation of G proteins (GTP-binding proteins). Figure 2. Dopamine interacts with 5 dopamine receptors. Dopamine sites of synthesis: Dopamine is produced in the mid-brain region, the substantia nigra and the ventral tegmental area. Dopamine is also stored in the hypothalamus (another region of the brain); here dopamine acts as a hormone to block prolactin release from the pituitary (see http://users.rcn.com/jkimball.ma.ultranet/BiologyPages/H/Hypothalamus.html ). Dopamine physiology: As a neurotransmitter in the brain, dopamine has many key physiological functions as summarized below [Figure 3 (also see https://en.wikipedia.org/wiki/Dopamine )]. An imbalance of dopamine, either by deficiency or in excess, can promote several disorders. Figure 3. Some of the physiological roles of dopamine. Role of dopamine in movement- Dopamine has a key function in controlling our movements; dopamine is part of the basal ganglia motor loop in the brain. Role of dopamine in cognition- Dopamine helps control the information flow of memory, attention and problem solving In the frontal lobes of the brain. Role of dopamine in reward, pleasure and motivation- Dopamine is part of the brain’s reward/pleasure system; providing feelings of pleasure and helps to motivate us doing these activities. 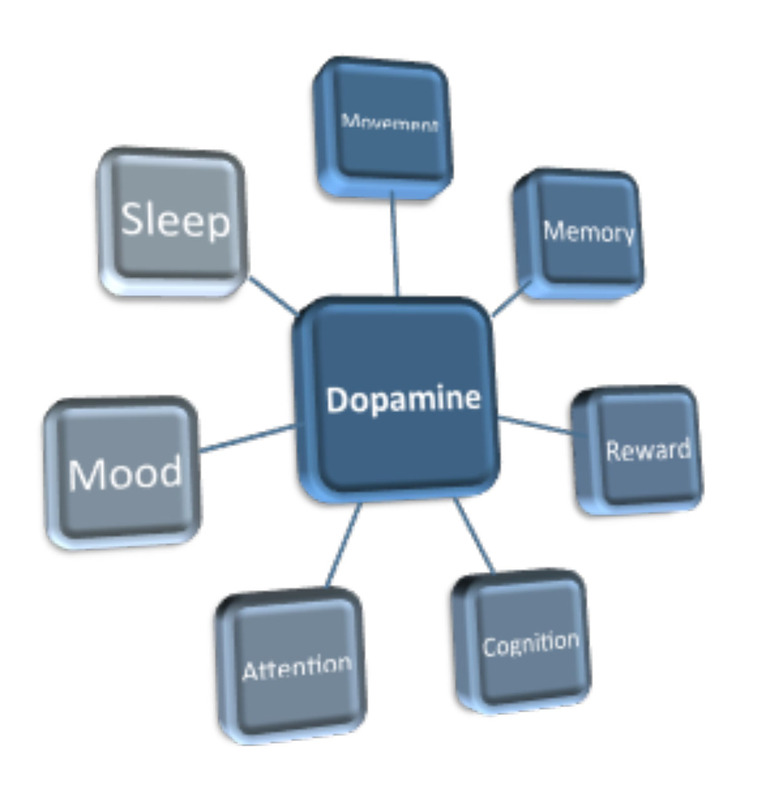 Role of dopamine in attention- Dopamine helps in focus and attention. Vision augments the dopamine response in the brain, which then helps us focus. Role of dopamine in sleep regulation- Dopamine helps regulate the “circadian rhythm” in the pineal gland, which is the brain process to adapt to the time of the day (light and dark cycles). Role of dopamine in psychosis and addiction- Dysfunction of the dopamine system is also associated with psychosis and schizophrenia. Drugs of the class called phenothiazines block D2 dopamine receptors, which subsequently reduce psychotic symptoms. Cocaine and amphetamines have been found to inhibit the re-uptake of dopamine. Thus, amphetamines and cocaine greatly increase dopamine levels; their use can cause psychosis. Strategies for treating Parkinson’s: The loss of dopamine neurons in the mid-brain substantia nigra region leads to Parkinson’s, in which a person has rigidity, slowness of movement, postural instability, and typically a resting tremor. A future blog will contain more of the details of pharmacological (drug) therapy for Parkinson’s; included below is just a description by class of drugs (adapted from http://www.pdf.org/en/meds_treatments ). Dopamine agonists are ‘mimics’ of dopamine that pass through the blood brain barrier to interact with target dopamine receptors. MAO-B inhibitors block an enzyme in the brain that breaks down levodopa. MAO-B inhibitors have a modest effect in suppressing the symptoms of Parkinson’s. COMT inhibitors prolong the effect of levodopa by blocking its metabolism. COMT inhibitors are used primarily to help with the problem of the ‘wearing-off’ phenomenon associated with levodopa. Removing the purple haze of Parkinson’s: Eighteen months ago, I started using a dopamine agonist, combined with a complementary and alternative medicine (CAM) approach, PT/OT/speech therapy (LSVT-BIG and LSVT-LOUD), and a lot of exercise. Additionally, with encouragement/support from loved ones/family, friends, students, colleagues and physicians/PT’s, my health has significantly improved. The purple haze that existed before the Parkinson’s diagnosis has cleared and my symptoms have improved. Like you, I am trying to live life well, and to stay positive, persistent and strong. Like you, each day I focus on what matters the most; I am still here, and you’re still here. We both have a lot yet to offer. Stay hopeful.